Wikipedia explains about marketable securities directly issued by the United States Government. Treasury notes (or T-Notes) mature in two to ten years. They have a coupon payment every six months, and are commonly issued with maturities dates of 2, 3, 5, 7 or 10 years, for denominations from $100 to $1,000,000. The 10-year Treasury note has become the security most frequently quoted when discussing the performance of the U.S. government-bond market and is used to convey the market's take on longer-term macroeconomic expectations. 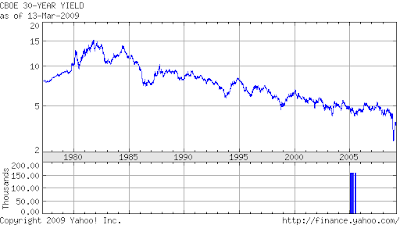 Treasury bonds (T-Bonds, or the long bond) have the longest maturity, from twenty years to thirty years. They have a coupon payment every six months like T-Notes, and are commonly issued with maturity of thirty years. The secondary market is highly liquid, so the yield on the most recent T-Bond offering was commonly used as a proxy for long-term interest rates in general. This role has largely been taken over by the 10-year note, as the size and frequency of long-term bond issues declined significantly in the 1990s and early 2000s. The U.S. Federal government stopped issuing the well-known 30-year Treasury bonds (often called long-bonds) for a four and a half year period starting October 31, 2001 and concluding February 2006. As the U.S. government used its budget surpluses to pay down the Federal debt in the late 1990s, the 10-year Treasury note began to replace the 30-year Treasury bond as the general, most-followed metric of the U.S. bond market. However, due to demand from pension funds and large, long-term institutional investors, along with a need to diversify the Treasury's liabilities - and also because the flatter yield curve meant that the opportunity cost of selling long-dated debt had dropped - the 30-year Treasury bond was re-introduced in February 2006 and is now issued quarterly. This brought the U.S. in line with Japan and European governments issuing longer-dated maturities amid growing global demand from pension funds. Treasury Inflation-Protected Securities (or TIPS) are the inflation-indexed bonds issued by the U.S. Treasury. The principal is adjusted to the Consumer Price Index, the commonly used measure of inflation. The coupon rate is constant, but generates a different amount of interest when multiplied by the inflation-adjusted principal, thus protecting the holder against inflation. TIPS are currently offered in 5-year, 10-year and 20-year maturities. Thirty-year TIPS are no longer offered. The shrinking supply of 30-year Treasury bonds is a big reason why long term interest rates have fallen. Treasury Bonds only make up 10 percent of the national debt today. There are several reasons for the reduced supply of long dated treasuries. 1) With many regarding Treasury bills as the least risky investment available, it became the preferred collateral for the global derivative and securities lending markets. As these markets expanded, the Treasury took advantage of the growing demand for Treasury bills to fund its operations with more short term debt. As a result, the size and frequency of long-term bond issues declined significantly in the 1990s and early 2000s, reducing the supply and pushing down yields. 2) The US government used its budget surpluses to repurchase 30-year Treasury bonds in the late 1990s. This helped drive the yield of Treasury bonds under 5 percent. 3) The U.S. Federal government stopped issuing the 30-year Treasury bonds for a four and a half year period starting October 31, 2001 and concluding February 2006. This lack of supply helped keep the yield of Treasury bonds under 5 percent. Bloomberg reports that $1.1 trillion new Treasuries need to be sold by year-end. Investors anticipating another "summer rally" may be disappointed as Treasury Secretary Timothy Geithner accelerates debt sales to finance a record budget deficit. After more than doubling note and bond offerings to $963 billion in the first half, another $1.1 trillion may be sold by year-end, according to Barclays Plc, one of the 16 primary dealers that are obligated to bid at Treasury auctions. The second-half sales would be more than the total amount of debt sold in all of 2008. Combined with the 2.2 trillion debt that needs to be rolled over, the treasury needs to sell 3.3 trillion dollars in the next six months. It will be very interesting to see how they manage such a feat. The "Yield Curve Mambo" video above shows the yield curve being flattened by the shrinking supply of long dated US debt as the t reasury switched to funding itself through short term issuances (no 30-year treasuries being sold from October 2001 to February 2006). Also note how the 963 billion treasuries sold in the first half of the year has begun to drive up the yield curve. Many people are fond of pointing out that the US doesn't borrow in foreign currencies and so it can always print its way out of debt. Unfortunately, that isn't really the case. TIPS securities act like foreign denominated bonds in that their repayment burden increases with each fall of the dollar. This is due to the obvious fact that a falling dollar drives up commodities and inflation. So when the dollar's collapse picks up steam, TIPS will prove as big a problem for the US as if the debt was denominated in a foreign currency. All the Fed's sellable assets are interest bearing securities, whose market value is vulnerable to interest rate fluctuation. Worse, of these interest bearing securities, over half of them have a maturity of over ten years, as seen in the graphic below. Over the month of June, the Fed reduced its holding of short term low risk assets and increased its holdings of long term debt securities. 1) The fed sold 1 billion Treasury bills (less than 1 year maturity). 3) 67 billion central bank liquidity swaps were repaid. If the fed tries to liquidate its assets to shrink the money supply, it will get less today than it would have a month ago. This entry was posted in Background_Info, Currency_Collapse, Federal_Reserve, Financial_Wizardry, Treasury, Wall_Street_Meltdown. Bookmark the permalink. Thanks for your great work. I am of the opinion that TIPS will be defaulted first in a currency devaluation situation. I ahve been reading for about 1 month, love the content. Suppose you are right, TIPS is only 8% from total treasury. Lets say USD drop 20%, 8% x 1.2 = 9.6% only. This only add up 1.6% of debt burden. Isn't it? How bad is this?? 20% is not exactly a currency collapse. I'd expect more along the lines of a minimum loss of 50% in a few months in Eric's scenario, and far more over time. Re: Ben Franklin's will be cheaper than charmin's 'brazilian rainforest toilet paper' americans use right now. The same exact question came to my mind as I read the paragraph dismissing those who state that the U.S. will print its way through this problem. In addition, even though TIPS will raise U.S. obligations when inflation eventually hits, and I agree with Mr. deCarbonnel that it eventually will, this only means a bit more printing to cover the increased obligation. Granted, this may in and of itself further drive up inflation and devalue the dollar, but the extra - inflation increase/dollar devaluation - will be slight due to the small amount of TIPS on the market. My question is not meant to minimize the severity of the ongoing situation. It is only to agree that there appears to be a flaw pertaining to this particular statement. The Fed seems to think it has an almost limitless ability to increase the money supply. I will never again under-estimate them on this. This caveat aside, good piece. I look forward to Mr. deCarbonnel�s reply. Sorry, the way you are calculating it is a little wrong. See examples below. 1) Lets say USD drop 20%. Thank you for the math examples clarifying your earlier point. Based upon your examples, you seem to believe that an extreme devaluation is possible. I agree that this is possible though I am uncertain as to how probable it is. You have stated that the U.S. could not print its way out of such a situation. I tend to agree. However, what is the alternative? Do you believe that the U.S would default on its obligations, or in other words, declare insolvency?